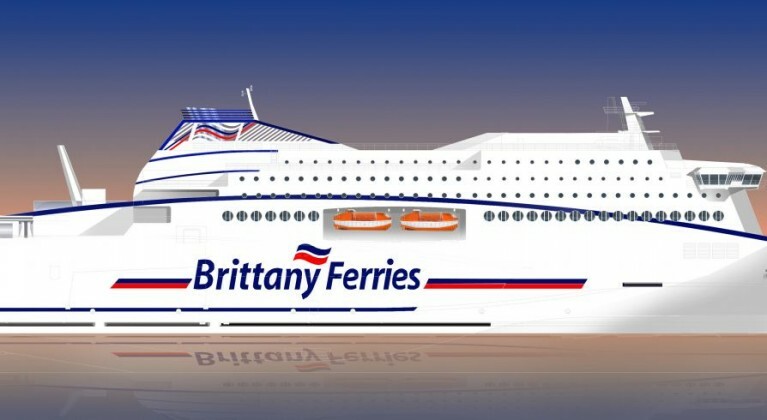 Brittany Ferries announced the charter of a third brand new cruise-ferry to serve its long-haul routes. To be powered by LNG, the ship will be built at the AVIC Weihai Shipyard in China and is due to join Brittany Ferries’ network in 2023. As yet unnamed, the new ship will be chartered from Stena RoRo and will be built to the Swedish shipowner’s E-Flexer design. Its arrival will bring to three the number of E-Flexer class ships in Brittany Ferries’ fleet following the arrival of Galicia in 2021 and Salamanca in 2022. Brittany Ferries is also constructing another new ship, Honfleur, at the FSG shipyard in Flensburg Germany, for delivery expected in late 2019. The charter agreement, which includes an option to purchase, represents the next step in a fleet renewal and investment program worth around €550 million. It will offer increased capacity and comfort for customers as well as employment of French seafarers. Brittany Ferries is committed to fleet renewal and a more sustainable future. Like Salamanca and Honfleur, the new ship will be powered by LNG. The three 42,200 tonne E-Flexer class ships will be among the biggest in Brittany Ferries’ fleet. Each will be 215 meters long with 3,000 garage lane meters for freight vehicles, and capacity for around 1,000 passengers in 340 en-suite cabins.